Update: I am amazed at how widely this blogpost is being shared. Despite being live for just 3 days it is being read on every continent apart from Antarctica. Evidently trade unions everywhere are anxious to learn from PCS and UCU’s outstanding good practice in how to treat disabled trade unionists. I’m being completely inundated by comments, which overwhelmingly are positive and supportive, and I haven’t been able to keep up with managing and moderating them, sorry. There have been several requests for more information. I am preparing responses which I’ll post in another blogpost as soon as I am able. In the meantime, most of the answers to comrades’ questions can be found in the sister blogpost to this one here. I am also aware of the “welfare visit” defense being circulated by PCS’s defenders. I don’t know whether this defense has originated from within PCS, but as the union’s never contacted me with an explanation for its actions I’ve no idea what their defense/justification is. I would encourage all the PCS folks who’ve contacted me to share their disgust at their union’s behaviour to ask for an explanation. And if someone could share that explanation with me I’d be much obliged. One night in October I was awakened near midnight by the police, who told me they had come to ask me some questions relating to my “criminal Facebook posts”. They proceeded to question me very aggressively about my activities as convenor of DPAC Caerdydd, a Disabled People Against Cuts direct-action campaigning group in Cardiff. The full complaint to South Wales Police over the incident was published by the political blogger Tom Pride, and the police’s actions attracted a great deal of condemnation from MPs, Welsh Assembly members, the disability activism community and the wider Left, and there was much concern about whether the police were deliberately targetting disability activists. But it turned out that the police had been set on me by none other than PCS, the trade union that has been in the vanguard of the fight against the ConDem government. No. I couldn’t believe it either. Let me try say that again. PCS set the police on me for organising a peaceful direct-action campaign against the Welfare Reforms. PCS also made a complaint to my own union, UCU, of which I am Wales vice chair. 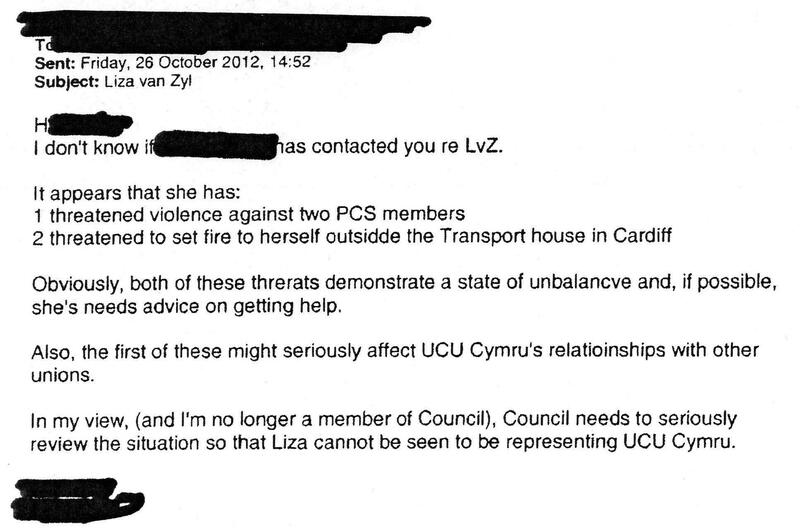 UCU knew that PCS were intending to set the police on me before the arrival of South Wales Police at my door. And yet no-one in UCU deemed it necessary to inform me that (a) PCS had made a complaint of a very serious nature against me, and (b) that they had also gone to the police. I’m not sure which is more unforgivable. That PCS set the police on me as a means of shutting down a line of argument they didn’t like, or that my own trade union colluded in this. Because of UCU Wales’ concerns about the possible damage my disability activism may do to our relationship with PCS, I have agreed to stand down as convenor of the disabled-people’s movement in Wales and have no further involvement in disability activism. This does not appear to have been sufficient reassurance that I will not get up PCS’s nose again, as I have been manoeuvred out of the Wales Vice Chair position. I will have no further role in UCU Wales. South Wales Police have a disastrous track-record when it comes to the policing of peaceful protest. And it is undeniable that there are very serious problems with regards the way the police across the UK handle complaints or are held to account for their actions – one only needs to remember Ian Tomlinson and Mark Duggan. But in this case, South Wales Police turned out to not be the Bad Guys. The offices who arrived at my door that night handled things appallingly – but they were being used as pawns to further a political objective, namely shut up that annoying campaigner who’s criticising us. They were acting on information given to them by PCS: a cynical use of comments extracted from a lengthy and highly adversarial Facebook comment thread and taken completely out of context, that I was a “threat” to DWP employees. The South Wales Police’s handling of my formal complaint against them has been outstanding. I am fully satisfied with the steps that will be taken to ensure that the officers in question understand why their conduct on the night (and subsequently at protests when I was identified and labled a “ringleader” of protests I had not organised) was unacceptable. The Chief Constable will be sending out a brief to all officers about their duties to facilitate peaceful protest by disabled people against the DWP’s barbarity, with particular reference to facilitating lawful protest and campaigning activities carried out by those of us with mental health conditions. While there were failings on the part of the police (not insignificant failings – and they had consequences in terms of the impact on my health), these failings are minuscule compared to the disgraceful roles played by PCS and UCU in this saga. In addition, in complete contrast to PCS and UCU, the police’s handling of my complaint against them has been simply outstanding. I really appreciate the amount of time they took to deal with matters and to really listen to me with compassion, and their willingness to acknowledge that the officers’ conduct fell short, and their bending-over-backwards to address my concerns. I therefore wish to set the record straight publicly by publishing the letter below to the inspector who dealt with my complaint against the South Wales Police, and will ask Tom Pride to update the original blog post accordingly. In the letter below, names have been removed. I apologise for my long delay in responding to you. I am happy to sign off the paperwork and confirm that I agree for South Wales Police to resolve the complaint through Local Resolution, with the steps you outline in the document you sent me with regards the advice that will be given to the officers concerned. The reason for my delay in responding to you is that I have come upon more information about the original report made to the police that led to the incident of October 26th. This information raises further matters which need resolving and which I need to bring to the attention of the police. I am unsure how best to take these matters forward. I would be very grateful for an opportunity to meet with you again to discuss these matters and the issues they raise, and to explore the options available to me to proceed. I now know why the police were approached with regards the concerns that I was a danger to DWP staff, and I also now know who raised these concerns. In terms of Who: I have been informed by my own trade union, UCU, in which I hold office as Wales Vice Chair, that it was the trade union PCS that approached the police with a concern that I presented a danger to DWP employees. In terms of Why: there were no reasonable grounds for PCS to genuinely believe I was a danger to their members working in the DWP. The decision to go to the police was a political decision, namely to do with the internal politics within PCS, and was motivated by a desire to shut down legitimate debate about PCS’s campaigning priorities with regards opposing the Welfare Reforms. 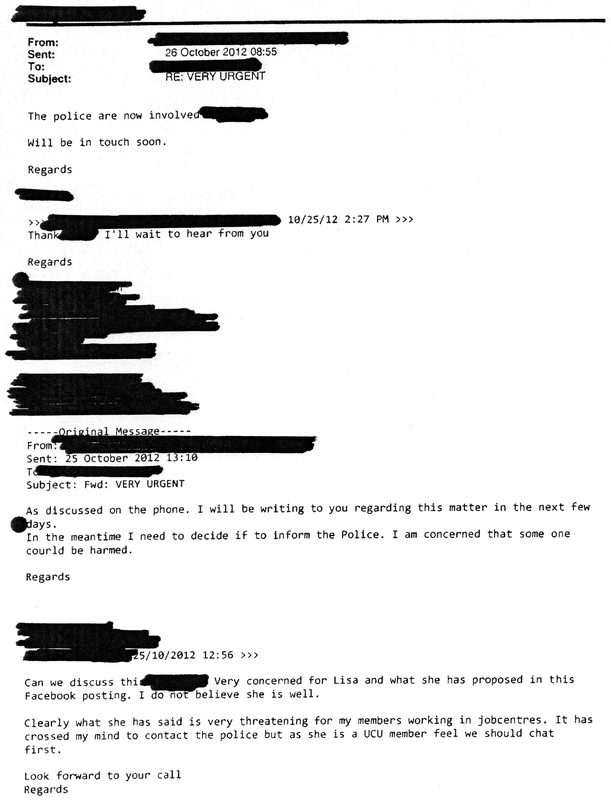 The South Wales Police had no option but to act on the information presented to them by PCS. The police were used as a tool in pursuit of a political objective by an internal political faction of the union, namely to shut down criticism (through intimidation) that by refusing to engage with the disabled-people’s anti-cuts movement in Wales (of which I was the leader) PCS was breaching its own DWP Group Conference motions and policy, and was failing to take seriously the deaths of 73 disabled people a week that are dying after having their benefits stopped. I therefore believe that those who made the decision to set the police on me acted maliciously and are guilty of wasting police time. The Facebook quote that PCS cited in their complaint against me (that perhaps if more disabled people were to go set themselves alight in front of DWP staff, that might facilitate PCS taking the plight of disabled people more seriously) was taken completely out of context: it was an expression of exasperation that came at the end of a lengthy thread in which disabled activists were being given a really hard time by elements of the ultra-left for campaigning against the DWP (which is felt by some to be an attack on PCS – disabled people are being accused by some elements of the ultra-left of “dividing the working class” and “attacking rank and file workers” for campaigning against the Welfare Reforms, because it is felt by some that focusing on what’s happening to disabled people will take PCS’s focus away from leading the build-up to a general strike). As the convenor of the disabled-people’s anti-cuts movement in Cardiff I always made it very clear (there’s plenty of evidence of this on Facebook) that we never target individual DWP staff. I had on several occasions had to stop disabled people from targetting DWP staff (slashing tyres, bullying DWP employees on Facebook, etc) and I’ve twice had to spend an entire night talking a desperate disabled person out of going down the Jobcentre the following morning and committing suicide in front of DWP employees in some horrific fashion. I repeatedly made the above very clear in the same Facebook thread in which I made the exasperated and furious comment that it would need disabled people to go set ourselves alight in front of jobcentre staff before PCS would take our plight seriously. It is very clear to anyone reading the thread in its entirety that my comment was an an expression of exasperation against those who were accusing disabled people of “dividing the working class” by distracting PCS from its job of leading the build-up for a general strike. Our Facebook forum contained some 700 members, mainly disabled people whose lives are being destroyed by the DWP, but also all of the PCS reps in South Wales who’re on Facebook, including most of the PCS Wales Council and PCS Wales Office staff. The forum was used by many disabled people to sound off, and we frequently had to deal with very desperate people expressing very desperate views about the DWP and its employees. The PCS officers and officials were well aware of the numerous times I articulated the principles in point 1 above. Many disabled people made far worse comments about DWP staff, and far more overt threats against them (which I dealt with robustly), than I did in the comment PCS cite in their complaint against me. My commitment to ensuring that DWP employees are not targetted, as well as being well-documented on Facebook and elsewhere, was also well known to the PCS Wales office. I met with them in September to discuss the campaign and to impress upon them that while the DWP was a legitimate target for peaceful direct action (given that it is the arm of the state that is responsible for the deaths of 73 disabled people a week), we were in no way targetting DWP employees and would make that very clear to all our activists and supporters. I asked PCS at that meeting to phone me on my mobile at any time of night or day should any disabled person threaten or attack DWP employees so that I could persuade the person concerned that there are more constructive ways to protest. People are desperate: hundreds of thousands of disabled people are having their lives destroyed by the DWP and 73 of us are dying every week after our benefits are stopped. People are understandably being driven to desperate acts. But such individual acts of desperation are negative and destructive; it is the aim of the disabled-people’s anti-cuts movement to channel such energies into more positive and constructive forms of protest, namely peaceful direct action. Earlier in October the PCS Wales General Secretary, Mark Serwotka, was the invited speaker at a Merthyr Tydfil Trades Council meeting, the president of which is a senior PCS officer on the PCS Wales Council and TUC Wales General Council. Serwotka had to return to London that same night and there was no convenient train from Merthyr to Cardiff. 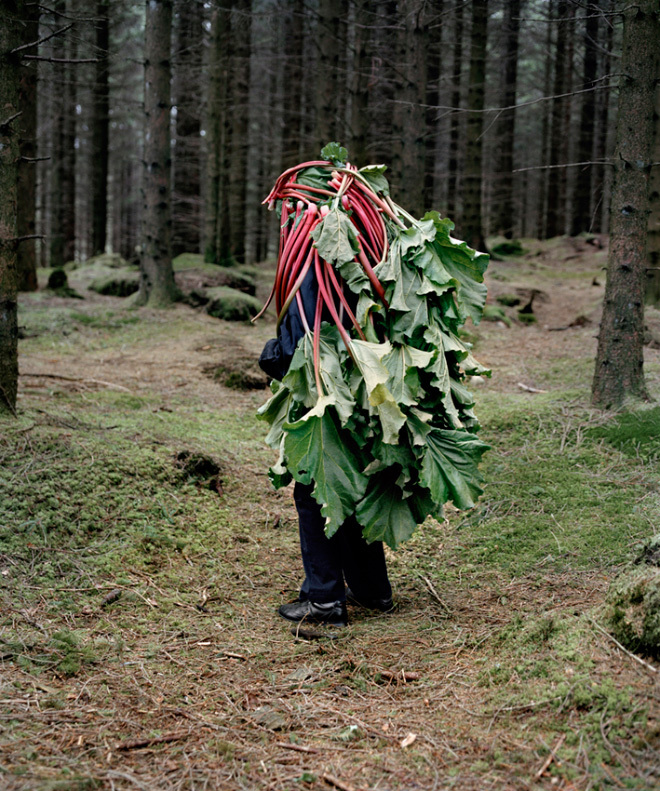 So during the planning of the meeting, I was asked if I would mind giving Serwotka a lift from Merthyr to Cardiff [in the event I didn’t need to do so as an alternative was found]. If PCS officers were willing to entrust their General Secretary to me for a 30-mile drive from Merthyr at night and alone, it is ludicrous for them to claim that less than 3 weeks later I’m such a threat to the safety of their members that it justifies involving the police. The disabled-people’s anti-cuts movement in Wales had only been formed in August, but by October it was the most high-profile of all the disabled-people’s anti-cuts groups in the UK, carrying out high-profile direct-actions on a weekly or fortnightly basis. The Welsh movement also had the most challenging attitude to PCS, and was becoming increasingly vocal in its criticism of PCS Wales for failing to engage with the disabled-people’s movement in Wales and for breaching its own conference policy and motions with regards campaigning against the Welfare reforms. In addition to going to the police, PCS also made a complaint to my own union UCU. 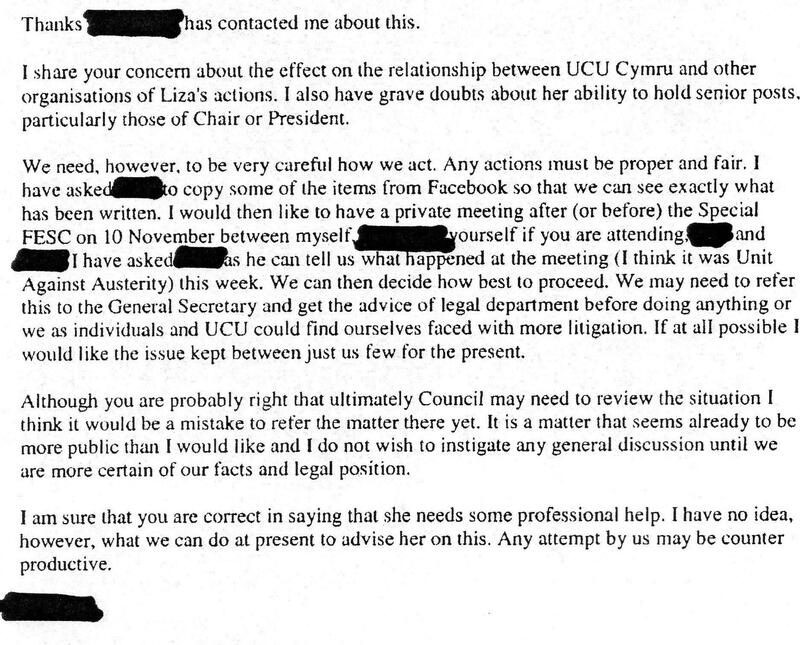 This is not the first time UCU has received a complaint from PCS in relation to myself: earlier this year [a senior elected officer] of PCS (of the same political faction as the faction that believes “the decks should be cleared” of other campaigning priorities to build for a general strike) made a complaint to UCU against me in my capacity as UCU Wales Vice Chair that was found by PCS to have been groundless and an inappropriate use of [PCS elected office] in order to make a political attack. The [PCS officer] was miffed with me because I had stopped her political party, the Socialist Party, from inappropriately – and in breach of UCU rules – using a UCU branch as a platform for political entryism. I was subjected to a good deal of bullying from Socialist Party full-time officials because of this, and the complaint to UCU by the [PCS Officer], who is a senior officer in the Socialist Party, was a political attack on me. I am giving you this example to show that political factions in PCS are not adverse to making malicious complaints against those they perceive to be their political enemies in order to achieve political objectives. Therefore I believe that PCS had no grounds to go to the police, and I further believe that the action was malicious and an attempt to intimidate me (which was successful) and make my position as UCU Wales Vice Chair untenable (also successful) in order to shut down debate about the most effective way to campaign against the Welfare Reforms and legitimate criticism of PCS. It is completely unacceptable that a trade union (or more correctly a political faction within a trade union) should seek to shut down legitimate debate and criticism by setting the police on a disability activist with no justification. I am also very aware of what a bad press South Wales Police have had as a result of this incident, which has received the scrutiny of the press and several AMs and MPs. While the officers handled the case badly, it is not true, as many initially believed, that the South Wales Police are trying to intimidate disabled activists. On the contrary, the South Wales Police officers who have dealt with our direct actions have overwhelmingly been outstanding, and have treated us immense compassion and sympathy, even when we have put them in some incredibly unpleasant positions, for example forcing them to arrest us and drag us out of roads during rush-hour traffic. It is completely unacceptable that the South Wales Police are now widely viewed as oppressing disabled protesters when in fact they were simply used as a tool by a political faction of a trade union. This is particularly unjust given that many of our disabled activists have received much more compassion, sympathy and support for our cause from the police officers sent to deal with the chaos our direct actions cause, than we have from DWP staff and members of PCS. I am anxious to set the record straight, and with your permission I would like to ask the political blogger Tom Pride to publish this letter to you (edited for anonymity) as an update to his post linked to here, and to send a copy of the letter to those MPs and AMs who offered to pursue the matter on my behalf. The question I am now faced with is what do I do about the matters above. This episode caused me immense distress and impacted negatively on my health. It is intolerable that a political faction within a trade union should intimidate a disabled activist in this way simply because they don’t like the arguments her movement are articulating. I had hoped to address this matter through my own trade union’s democratic structures, to get UCU to fraternally, tactfully, and in the most constructive way possible, indicate to PCS that the intimidation of disabled activists in this manner is completely unacceptable. Unfortunately this option has been shut down by the UCU general secretary. My only option therefore is to make a complaint to the police against those who initiated the matter with the police[*], on grounds that it was malicious. I would also strongly urge you to pursue a case of wasting police time against the perpetrators, and when I meet with you I will give you all the evidence I have at my disposal. It is, however, very important to me to not cause trouble for PCS employees. I do not know who exactly from PCS went to the police, but the chances were that it was a PCS employee acting on the instructions of an elected PCS officer. It is the elected officers and the political faction they are a part of who are guilty of this cynical use of the police to intimidate me and shut down a line of argument they didn’t like which was gaining public momentum not the PCS employee who carried out their instruction. Could you outline for me what the consequences would be for the person who went to the police initially should I make a complaint? Please let me know when would be convenient for us to meet again. I am free all week this week. I would like to say how impressed I am with the way my complaint over the conduct of the police officers has been handled. I very much appreciate the time you and your colleagues have put into investigating this matter. I also very much appreciate the way I was listened to, and the way all my concerns were taken seriously and addressed. As a trade union officer experienced in representing members in grievances, I can honestly say that the South Wales Police’s handling of complaints, and complainants, is considerably superior to the way complaints are dealt with in the workplaces I’m familiar with, and within our trade unions. [*] In the end, and after discussion with the police, I decided not to make a complaint to the police against PCS. As a trade unionist I do not feel it is appropriate to set the police on other trade unionists. Even when they do so to me. This entry was posted in Uncategorized and tagged DPAC, general strike, mental health, PCS, Serwotka, Socialist Party, UCU, Welfare Bill on January 28, 2013 by Loony Lefty.